picked up at Finish Sun, am. or very late Sat. night. more seven mile 4-6%mountain type climb to the summit, Julian, where you may pass the one-horse buggy walking along the one block. chocolate-chip type hills, then flats with a tailwind, usually,that eventually lead to the left –fork turn towards the town of Borrego. five mile descent, on the way to Cold Grade Rd Fruit Smoothie Rest Stop. on the entire route, and now behind you, as you make your way on over to Lilac Road, a 1-3% grade back road, to a ten mile descent. 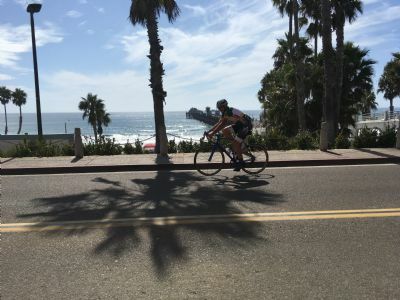 The rest of the terrain is flat, 15 miles, all the way back to Oceanside; with the last seven miles on the bike path, ending at the ocean. full support, along with 6 Rest Stops plus dinner at the Finish. Time limit is approx. 20:30 and is a timed event; not a race. north. There is a large parking lot, a half mile south, if driving in that morning. This is a California Triple Crown approved Double Century. See You at the Top, "Unstopable"!